In the nearly seventy years of exploration, development and production since the discovery of “big oil” at Leduc #1 in 1947, the Canadian Oil Patch has produced a few millionaires and some billionaires (including AIMCo, the Alberta Investment Management Company) but it is currently worth less than $350 billion or just 50% of one “iPhone” discovery (please see Exhibit 2 below). The Energy Minister (Mr. Oliver quoted in Reuters, October 7, 2012) has said that we will need another $650 billion of new investment over the next ten years in order to further develop the current projects to maturity, which, of course, includes the tar sands and synthetics, as well as conventional oil & gas development if not new exploration. This year, the Oil Patch has handed investors – 80% of whom are said to be “foreign” – a (-11%) loss of capital (plus some dividends) and not even the Perpetual Bond™ has been able to eke out more than a +4% return (plus some dividends) from the allegedly strategic Canadian Business of oil & gas exploration, development and production (please see Exhibit 1 and 2 below) which, incidentally, also explores, develops and produces oil & gas in many distant parts of the world and not just in Canada. Are we complaining? No, not at all. As risk averse investors, we did our job and took timely profits in NXY Nexen Incorporated and PRQ Progress Energy Resources Corporation as soon as the petitions to acquire and their prices were announced. (Please see our recent Post, The All Canadian Four Play, October 2012, for more details on these companies.) Nevertheless, many investors are still hanging on to these stocks even now, pending a further review of foreign ownership, legal and regulatory concerns. But why? Do they have reason to expect a still higher price and are they discounting the possibility that there will be no price at all? That’s not, really, how the game is played. Please see our Post, Maximising Shareholder Value (LOL), August 2012, which discusses the difference between “maximising” shareholder value and “optimising” it. Our next big job is that we will need to raise at least $650 billion over the next ten years in order to develop the current projects. We can do it by ourselves in less than one hundred years, one would think, and perhaps by then oil & gas in the ground, tar sands and synthetics will indeed be valuable and scarce commodities (which they aren’t now) or they may be – just may be – as obsolete and irrelevant as the rotary dial as new sources of energy emerge (which many people have reason to hope for). There are about one hundred and twenty companies in the Canadian Oil Patch but less than forty that currently have a market value in excess of $1 billion (Exhibit 1 and 2 below) and of those, only twenty pay a dividend to the common shareholders. In order for an investor to make money on stocks that don’t pay dividends, they need to sell what they have at a higher price to some other investors (which could eventually be the company itself which, one might say, wants to own itself or be more attractive as a takeover target). The Cash Flow Summary (Exhibit 1 below) is in our usual notation and shows that if we bought 1,000 shares in each of the twelve companies (of forty) that were (B) in late December of last year, then the cost was $298,000 and under the usual (B)(N)-management of that portfolio, it is currently a portfolio of just eight companies (of forty) and worth $311,000 including a cash account of $111,000 which is not invested at the present time for a lack of new opportunities in this market or we could simply buy more of what we have if there are no other uses for the cash. On the other hand, had we bought 1,000 shares of each of all forty companies, then the cost was $920,000 and would be worth $815,000 now for a capital loss of (-11%) before dividends but including the extraordinary gains on Nexen and Progress Energy should they materialize. Failing that, there will be an additional loss of $17,000 as the share prices likely slump to what they were before, or less. 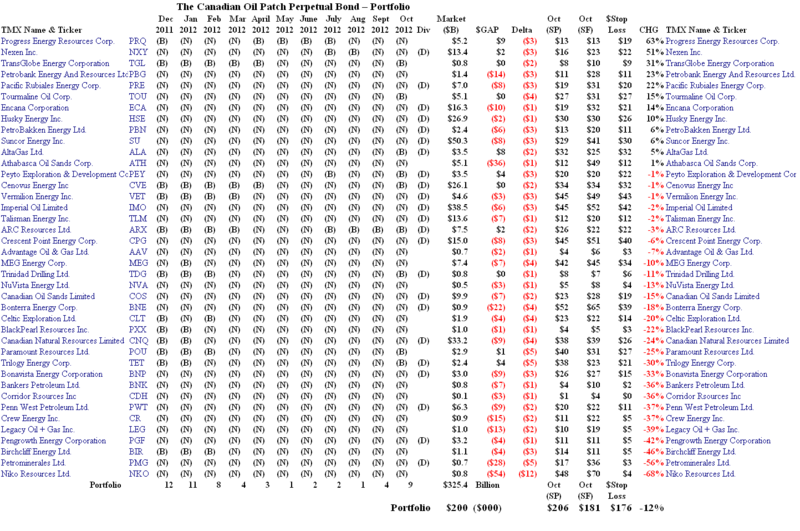 The Portfolio Chart (Exhibit 2) shows which companies and when they were eligible for inclusion in the Perpetual Bond. We only include a company while it is a (B) or changes from an (N) to a (B) and we always “sell” the stock on (B) to (N)-transitions using either a stop/loss or a bought put option on our long position (please see The Wall Street Put, August 2012, for more information on our “selling” discipline). The Chart is sorted by the stock price change (CHG column) since December and we note that some of the biggest price gainers this year were always (N) and, therefore, never included in our portfolio this year. 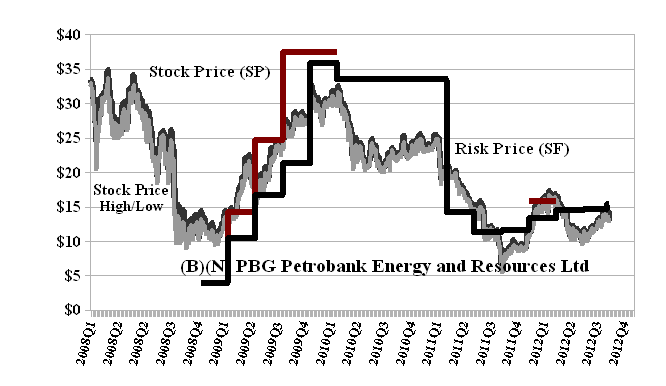 For example, PBG Petrobank Energy and Resources Limited, was in our portfolio in 2009 through 2010 at prices between $12 and $36 (Red Line Stock Price (SP) above the Black Line Risk Price (SF)) but the Risk Price (SF) (Black Line) remained plausibly high above the ambient stock prices subsequent to the spin-off of PMG Petrominerales Limited and an approximately $20 stock dividend paid to the previous shareholders at that time. Petrobank Energy & Resources Ltd. is an oil and natural gas exploration and production company operating in two Western Canadian focus areas, Southeast Saskatchewan and Northwest Alberta. Subsequent to the re-structuring of the company in late 2010, investors, basically and for the most part, sold-off their holdings at lower prices until $10 or less last year. Investor confidence appears to be recovering but the Risk Price (SF) is currently $15 and that is the least stock price at which we will buy the stock, and then only if the ambient stock price net of the demonstrated volatility appears to be above the Risk Price (SF). For more information on the Risk Price (SF) and what it means, please see our previous Post, The Price of Risk, August 2012. 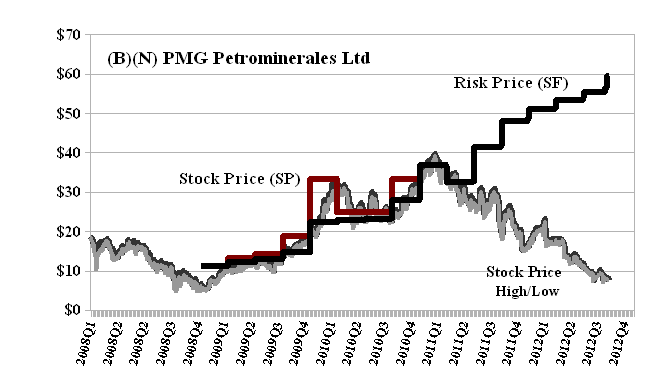 The Price Chart for the spin-off company, PMG Petrominerales Limited (please see Exhibit 4 below) is much clearer and we have not owned it since late 2010 when we sold-off the last of our holdings at $35. Petrominerales Limited is an international oil and gas company involved in the exploration, development and production of crude oil in Colombia and Peru. For more information, please follow the Tags or Categories attached to this Letter or simply enter Search for additional references to any term that we have used. Related data may be obtained from us (for free) in a machine readable format by request to RiskWerk@gmail.com. The author retains all copyrights to his works in this blog and on this website. The Perpetual Bond®™ is a registered trademark and patented technology of The RiskWerk Company and RiskWerk Limited (“Company”) . The Canada Pension Bond®™ and The Medina Bond®™ are registered trademarks or trademarks of the Company as are the words and phrases “Alpha-smart”, “100% Capital Safety”, “100% Liquidity”, ”price of risk”, “risk price”, and the symbols “(B)”, “(N)” and N*.